Copyright ® 2012 by Craig Dremann, text and photos, all right reserved. Jasper ridge April 2012, non-serpentine wildflowers along path, surrounded by exotic European grasses. The wildflowers along the trail edge, are indicating that there are still dormant native seeds still in the surrounding hillsides, and those wildflower seeds can be helped to grow by managing the exotic grasses that are currently suppressing them. 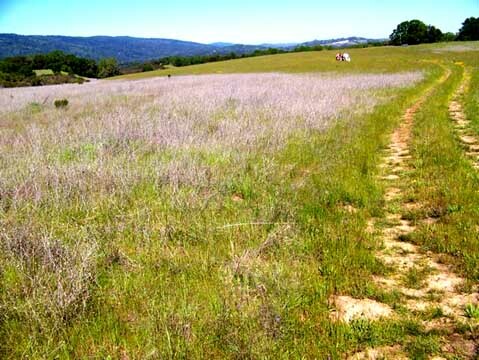 Jasper Ridge, April 2012, solid exotic grasses and dried yellow star thistle stems that remain from summer 2011. This is the location where the Endangered Bay Checkerspot butterfly (Euphydryas editha bayensis) was allow to go extinct in 1998, and climate change has been blamed. However, it is more likely that is was the lack of management of the exotic weeds that swamped out the butterfly native food and nectar plants, was the ultimate cause of the extinction. This is a perfect example of the lack of management of exotic weeds and the lack of ecological restoration of native ecosystems, resulting in the extinction of a species that needs a minimum amount of high quality native habitat, in order to survive. If native plant percentage of cover transects had been conducted each year along with the Bay Checkerspot butterfly counts, you could see the relationship between the food plant percentage cover and the butterfly populations. You would be able to measure what the minimum threshold of the native plant species cover is required for the butterfly's survival. 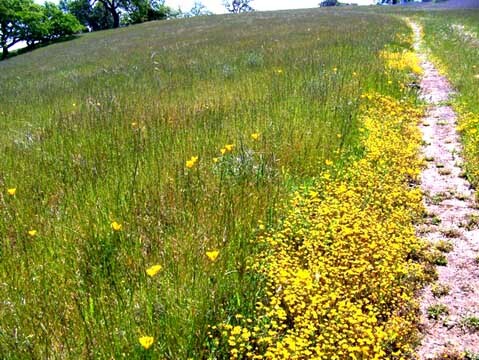 Subject: Resurrection of 100+ acres of wildflowers at Jasper Ridge? field restoration of anywhere I have seen so far on the peninsula. where the wildflowers still grow along the path. dormant native seeds, just waiting to sprout up and grow. thistle seedlings to shade and suppress them. thistle seedlings. Or string trimmers, or hand-grass cutting equipment. the native seedling germination the following winter. YST, but kill its seedling with a mulch of the cut weed grasses. about them, I want to be a co-author on the article(s). questions that you are studying today. could permanently get rid of that weed. are cut before the seeds matured. plant mixes most likely to resist further invasion. native cover in 180 days or less. costing $245,000 per acre, are still at 60% weed cover. resolved after forty years of study. you can see at http://www.ecoseeds.com/WMA.html. method as much as I have. foxtails, wild oats, ripgut grass and the rest.